Troparion of St. Makarios Tone 1 Dweller of the desert and angel in the body/ you were shown to be a wonder-worker, our God-bearing Father Macarius./ You received heavenly gifts through fasting, vigil, and prayer:/ healing the sick and the souls of those drawn to you by faith./ Glory to Him who gave you strength! Glory to Him who granted you a crown!/ Glory to Him who through you grants healing to all! Kontakion of St. Makarios Tone 4 The Lord placed thee in the house of discipline/ as a star enlightening the ends of the earth;/ thou didst settle in the desert as in a city/ and receive from God the grace to work miracles./ We venerate thee, Macarios, Father of Fathers. Saint Makarios the Great of Egypt was born around 331 in the village of Ptinapor in Egypt. At the wish of his parents he entered into marriage, but was soon widowed. After he buried his wife, Makarios told himself, “Take heed, Makarios, and have care for your soul. It is fitting that you forsake worldly life.” The Lord rewarded the saint with a long life, but from that time the memory of death was constantly with him, impelling him to ascetic deeds of prayer and penitence. He began to visit the church of God more frequently and to be more deeply absorbed in Holy Scripture, but he did not leave his aged parents, thus fulfilling the commandment to honor one’s parents. Until his parents died, St. Makarios used his remaining substance to help them and he began to pray fervently that the Lord might show him a guide on the way to salvation. The Lord sent him an experienced Elder, who lived in the desert not far from the village. The Elder accepted the youth with love, guided him in the spiritual science of watchfulness, fasting and prayer, and taught him the handicraft of weaving baskets. Having built a separate cell not far from his own, the Elder settled his disciple in it. The local bishop arrived one day at Ptinapor and, knowing of the virtuous life of the monk, ordained him against his will. St. Makarios was overwhelmed by this disturbance of his silence, and so he went secretly to another place. The Enemy of salvation began a tenacious struggle with the ascetic, trying to terrify him, shaking his cell and suggesting sinful thoughts. St. Makarios repelled the attacks of the devil, defending himself with prayer and the Sign of the Cross. Evil people slandered the saint, accusing him of seducing a woman from a nearby village. They dragged him out of his cell and jeered at him. St. Makarios endured the temptation with great humility. Without a murmur, he sent the money that he got for his baskets for the support of the pregnant woman. The innocence of St. Makarios was manifested when the woman, who suffered torment for many days, was not able to give birth. She confessed that she had slandered the hermit, and revealed the name of the real father. When her parents found out the truth, they were astonished and intended to go to the saint to ask forgiveness. Though St. Makarios willingly accepted dishonor, he shunned the praise of men. He fled from that place by night and settled on Mt. Nitria in the Pharan desert. Thus human wickedness contributed to the prospering of the righteous. Having dwelt in the desert for three years, he went to St. Anthony the Great, the Father of Egyptian monasticism, for he had heard that he was still alive in the world, and he longed to see him. Abba Anthony received him with love, and Makarios became his devoted disciple and follower. St. Makarios lived with him for a long time and then, on the advice of the saintly abba, he went off to the Skete monastery (in the northwest part of Egypt). He so shone forth in asceticism that he came to be called “a young Elder,” because he had distinguished himself as an experienced and mature monk, even though he was not quite thirty years old. St. Makarios survived many demonic attacks against him. Once, he was carrying palm branches for weaving baskets, and a devil met him on the way and wanted to strike him with a sickle, but he was not able to do this. He said, “Makarios, I suffer great anguish from you because I am unable to vanquish you. I do everything that you do. You fast, and I eat nothing at all. You keep vigil, and I never sleep. You surpass me only in one thing: humility.” When the saint reached the age of forty, he was ordained to the priesthood and made the head of the monks living in the desert of Skete. During these years, St. Makarios often visited with St. Anthony the Great, receiving guidance from him in spiritual conversations. Abba Makarios was deemed worthy to be present at the death of St. Anthony and he received his staff. He also received a double portion of the Anthony’s spiritual power, just as the prophet Elisha once received a double portion of the grace of the prophet Elias, along with the mantle that he dropped from the fiery chariot. St. Makarios worked many healings. People thronged to him from various places for help and for advice, asking his holy prayers. All this unsettled the quietude of the saint. He therefore dug out a deep cave under his cell, and hid there for prayer and meditation. St. Makarios attained such boldness before God that, through his prayers, the Lord raised the dead. Despite attaining such heights of holiness, he continued to preserve his unusual humility. One time the holy abba caught a thief loadng his things on a donkey standing near the cell. Without revealing that he was the owner of these things, the monk began to help tie up the load. Having removed himself from the world, the monk told himself, “We bring nothing at all into this world; clearly, it is not possible to take anything out from it. Blessed be the Lord for all things!” Once, St. Makarios was walking and saw a skull lying upon the ground. He asked, “Who are you?” The skull answered, “I was a chief priest of the pagans. When you, Abba, pray for those in hell, we receive some mitigation.” The monk asked, “What are these torments?” “We are sitting in a great fire,” replied the skull, “and we do not see one another. When you pray, we begin to see each other somewhat, and this affords us some comfort.” Having heard such words, the saint began to weep and asked, “Are there still more fiercesome torments?” The skull answered, “Down below us are those who knew the Name of God, but spurned Him and did not keep His commandments. They endure even more grievous torments.” Once, while he was praying, St. Makarios heard a voice: “Makarios, you have not yet attained such perfection in virtue as two women who live in the city.” The humble ascetic went to the city, found the house where the women lived, and knocked. The women received him with joy, and he said, “I have come from the desert seeking you in order to learn of your good deeds. Tell me about them, and conceal nothing.” The women answered with surprise, “We live with our husbands, and we have not such virtues.” But the saint continued to insist, and the women then told him, “We married two brothers. After living together in one house for fifteen years, we have not uttered a single malicious nor shameful word, and we never quarrel among ourselves. We asked our husbands to allow us to enter a women’s monastery, but they would not agree. We vowed not to utter a single worldly word until our death.” St. Makarios glorified God and said, “In truth, the Lord seeks neither virgins nor married women, and neither monks nor laymen, but values a person’s free intent, accepting it as the deed itself. He grants to everyone’s free will the grace of the Holy Spirit, which operates in an individual and directs the life of all who yearn to be saved.” During the years of the reign of the Arian emperor Valens (364-378), St. Makarios the Great and St. Makarios of Alexandria was subjected to persecution by the followers of the Arian bishop Lucius. They seized both Elders and put them on a ship, sending them to an island where only pagans lived. By the prayers of the saints, the daughter of a pagan priest was delivered from an evil spirit. After this, the pagan priest and all the inhabitants of the island accepted holy Baptism. When he heard what had happened, the Arian bishop feared an uprising and permitted the Elders to return to their monasteries. The meekness and humility of the monk transformed human souls. “A harmful word,” said Abba Makarios, “makes good things bad, but a good word makes bad things good.” When the monks asked him how to pray properly, he answered, “Prayer does not require many words. It is needful to say only, “Lord, as Thou wilt and as Thou knowest, have mercy on me.” If an enemy should fall upon you, you need only say, “Lord, have mercy!” The Lord knows that which is useful for us, and grants us mercy.” When the brethren asked how a monk ought to comport himself, the saint replied, “Forgive me, I am not yet a monk, but I have seen monks. I asked them what I must do to be a monk. They answered, ‘If a man does not withdraw himself from everything which is in the world, it is not possible to be a monk.’ Then I said, ‘I am weak and cannot be as you are.’ The monks responded, ‘If you cannot renounce the world as we have, then go to your cell and weep for your sins. '” St. Makarios gave advice to a young man who wished to become a monk: “Flee from people and you shall be saved.” That one asked: “What does it mean to flee from people?” The monk answered: “Sit in your cell and repent of your sins.” St. Makarios sent him to a cemetery to rebuke and then to praise the dead. Then he asked him what they said to him. The young man replied, “They were silent to both praise and reproach.” “If you wish to be saved, be as one dead. 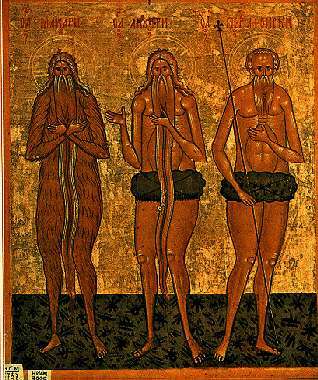 Do not become angry when insulted, nor puffed up when praised.” And further: “If slander is like praise for you, poverty like riches, insufficiency like abundance, then you shall not perish.” The prayer of St. Makarios saved many in perilous circumstances of life, and preserved them from harm and temptation. His benevolence was so great that they said of him: “Just as God sees the whole world, but does not chastize sinners, so also does Abba Makarios cover his neighbor’s weaknesses, which he seemed to see without seeing, and heard without hearing.” The monk lived until the age of ninety. Shortly before his death, Sts. Anthony and Pachomios appeared to him, bringing the joyful message of his departure to eternal life in nine days. After instructing his disciples to preserve the monastic Rule and the traditions of the Fathers, he blessed them and began to prepare for death. St. Makarios departed to the Lord saying, “Into Thy hands, O Lord, I commend my spirit.” Abba Makarios spent sixty years in the wilderness, being dead to the world. He spent most of his time in conversation with God, often in a state of spiritual rapture. But he never ceased to weep, to repent and to work. The saint’s profound theological writings are based on his own personal experience. Fifty Spiritual Homilies and seven Ascetic Treatises survive as the precious legacy of his spiritual wisdom. Several prayers composed by St. Makarios the Great are still used by the Church in the Prayers Before Sleep and also in the Morning Prayers. Man’s highest goal and purpose, the union of the soul with God, is a primary principle in the works of St. Makarios. Describing the methods for attaining mystical communion, the saint relies upon the experience of the great teachers of Egyptian monasticism and on his own experience. The way to God and the experience of the holy ascetics of union with God is revealed to each believer’s heart. Earthly life, according to St. Makarios, has only a relative significance: to prepare the soul, to make it capable of perceiving the heavenly Kingdom, and to establish in the soul an affinity with the heavenly homeland. “For those truly believing in Christ, it is necessary to change and transform the soul from its present degraded nature into another, divine nature, and to be fashioned anew by the power of the Holy Spirit.” This is possible, if we truly believe and we truly love God and have observed all His holy commandments. If one betrothed to Christ at Baptism does not seek and receive the divine light of the Holy Spirit in the present life, “then when he departs from the body, he is separated into the regions of darkness on the left side. He does not enter into the Kingdom of Heaven, but has his end in hell with the devil and his angels” (Homily 30:6). In the teaching of St. Makarios, the inner action of the Christian determines the extent of his perception of divine truth and love. Each of us acquires salvation through grace and the divine gift of the Holy Spirit, but to attain a perfect measure of virtue, which is necessary for the soul’s assimilation of this divine gift, is possible only “by faith and by love with the strengthening of free will.” Thus, the Christian inherits eternal life “as much by grace, as by truth.” Salvation is a divine-human action, and we attain complete spiritual success “not only by divine power and grace, but also by the accomplishing of the proper labors.” On the other hand, it is not just within “the measure of freedom and purity” that we arrive at the proper solicitude, it is not without “the cooperation of the hand of God above.” The participation of man determines the actual condition of his soul, thus inclining him to good or evil. “If a soul still in the world does not possess in itself the sanctity of the Spirit for great faith and for prayer, and does not strive for the oneness of divine communion, then it is unfit for the heavenly kingdom.” The miracles and visions of Blessed Makarios are recorded in a book by the presbyter Ruphinos, and his Life was compiled by St. Serapion, bishop of Tmuntis (Lower Egypt), one of the renowned workers of the Church in the fourth century. His holy relics are in the city of Amalfi, Italy.